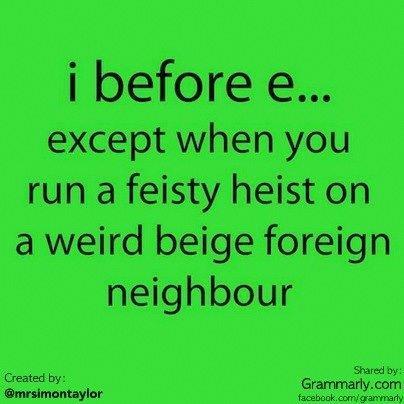 Most rules in English have exceptions and the ‘I’ before ‘e’, except after ‘c’ rule is no exception (pardon the pun). Generally words that have an ‘i’ and ‘e’ combination will have it in that order, unless preceded by a ‘c’. 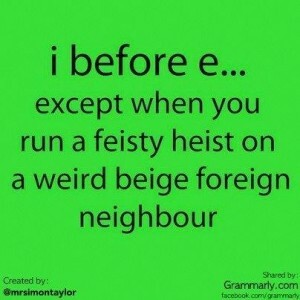 So ‘c’ usually makes ‘ie’ become ‘ei’. Interestingly some people insist the rule has too many exceptions to be worth learning! Here is a cute graphic, courtesy of my friend Claire Cohen, showing several exceptions to the ‘I’ before ‘e’, except after ‘c’ rule. Enjoy!